Materials: 5 skeins of Alice yarn (50% acrylic, 50% polyester, 100 g / 200 m.), Knitting needles 5.0 mm. Elastic 2 * 2: knit according to the scheme 1. 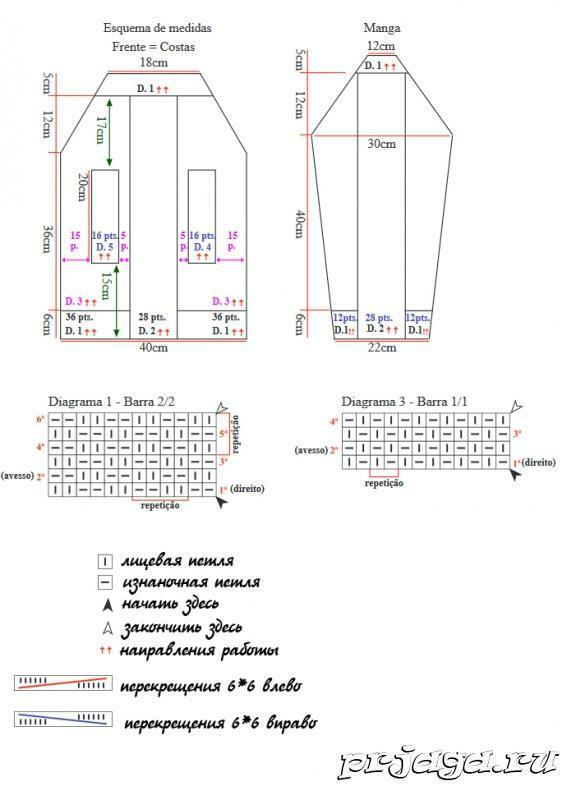 Elastic 1 * 1: knit according to the scheme 3. Crossing 6 * 6 to the right: remove 6 loops on an additional knitting needle for knitting, knit 6 faces from the left knitting needle, then knit 6 more faces. 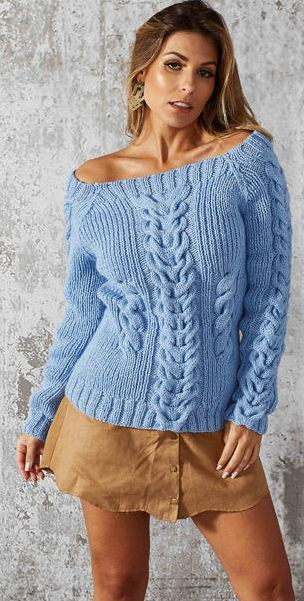 with extra knitting needles. Crossing 6 * 6 to the left: remove 6 loops on an additional knitting needle before knitting, knit 6 faces from the left knitting needle, then knit 6 more faces. with extra knitting needles. Back: dial 100 loops with needles of 5.0 mm. Knit 36 ​​loops with an elastic band 2 * 2, 28 loops according to the scheme 2, 36 loops with an elastic band 2 * 2. At a height of 6 cm. Loop that knit gum 2 * 2 continue to knit gum 1 * 1. At a height of 15 cm. Include in the braid pattern: knit 15 loops with an elastic band 1 * 1, 16 loops with a pattern according to the pattern 4, 5 loops with an elastic band 1 * 1, 28 loops with a pattern according to the pattern 2, 5 loops with an elastic band 1 * 1, 16 loops with a pattern pattern 5, 15 loops elastic 1 * 1. At a height of 35 cm. The braids according to scheme 4 are again replaced with 1 * 1 gum. At a height of 42 cm., Begin to perform raglan decreases: close on each side 23 loops in each second row — 12 times. At the same time at a height of 12 cm. From the start of raglan knit gum 2 * 25 on all loops. Sleeve: dial 52 loops with needles of 5.0 mm. At a height of 6 cm. Knit an elastic band 1 * 1 instead of an elastic band 2 * 2. At a height of 46 cm. Begin to reduce for raglan one loop on each side of the sleeve in each second row - 13 times. At the same time at a height of 58 cm. Start knitting with a rubber band 2 * 2 on all the loops. At a height of 63 cm. Close all loops. Assembly: seam raglan, sew the sides and seams of the sleeves.